Another finish on two fronts! One, this is on my Q2 Finish-A-Long list and it has also been a WIP for way to long! 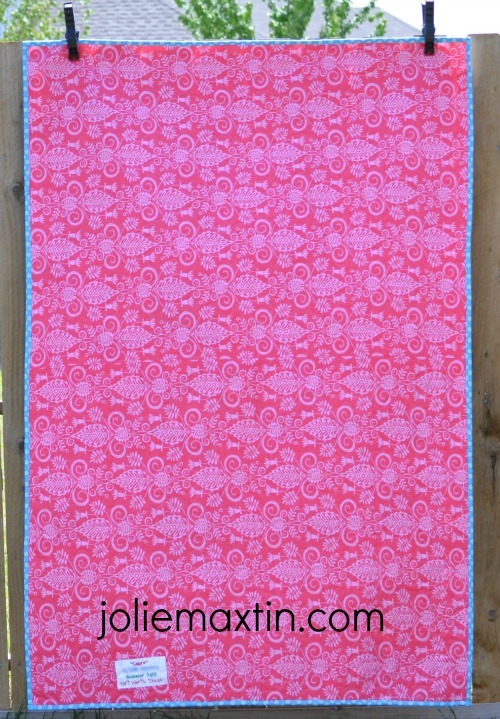 When I first started quilting, I joined lots of bees and NuBees was one of the original ones. You would request a particular color scheme and then each bee member would make 6 blocks (of their choosing) but in your color scheme. I always chose rainbow and I did the bee for 4 or 5 months so I received a good number of blocks. What do you do with blocks? Put them together in a quilt of course, so...this is my quilt, unoriginally called "Colors". Although I specified white, not all white is the same. When you see the quilt in person the variation of shades of white are not as obvious as in the photo. A couple of the blocks were too small but my quilter quilted them anyway. This was a good lesson to me of what happens when you don't square them up and how that throws the whole thing off. It was ugly but I'll never do it again. I even stitched the binding on thinking it wouldn't matter. It did, I took it off and added a strip before replacing. It looks ten times better now. 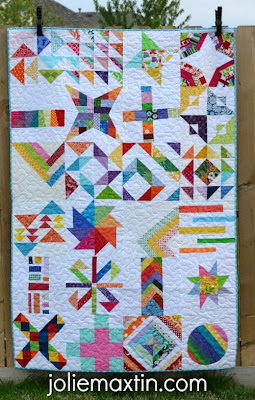 I still don't care for sampler quilts, they look too thrown together for my liking. The feeling of finishing a quilt is still good for the soul! I think this is a really beautiful quilt but I understand your dilemma. Finishing a quilt IS good for the soul! Love the colors! A bright border would have helped them to shine...but then again, I am a border gal. I need to find one of these "bees"! Congrats on the finish. As much as I like scrappy I've found that I'm not that big a fan of samplers either. With that said... I am a fan of bees and swaps and really enjoyed making and getting blocks in groups like 3x6, 4x5 and nubees. The biggest bonus is meeting great people. I've got one of those on Q2FAL list also. There could be a support group for just those blocks - we are not alone! Oh, I completely agree about samplers. I think they could be a lot of fun to make, but I really don't love how they look...it's nice to hear someone else say it. But congrats on a finish!! Julie this is awesome! 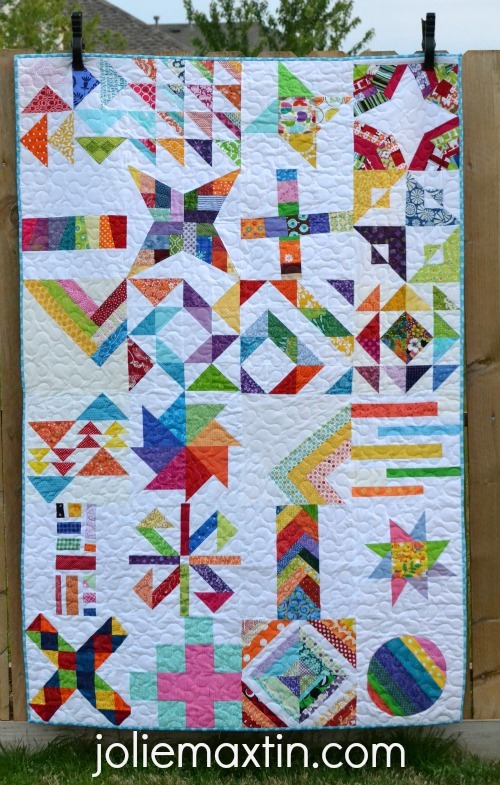 I think this quilt is amazing, I love all of the color. There is no way someone could look at this and not be happy!! Congrats on the finish! I understand your feeling about samplers sometimes the end result is not what we expect. But your quilt is absolutely beautiful. Boy Charity Quilt - Check! The Quilt for Maddie - It's a Hit!